The solution, named Ez-Farm, is aimed at tech-savvy farm owners who live in cities and hire managers to look after their farms in rural areas. These farm owners usually travel to their farms only over weekends and keep track of developments remotely by telephoning frequently. Such farm owners have been nicknamed 'telephone farmers'. "With growing demand and soaring prices for fruits, vegetables and flowers in Kenya in recent years, the number of entrepreneurs investing in small-scale farming in the country has boomed. Many of these are tech-savvy business people living in urban areas who can only travel to visit their out of town farms at the weekends and that is how we came up with this idea," said water research scientist at IBM Research - Africa Dr Kala Fleming. Fleming explained that in the future, the sensors could also transmit data about the performance and possible failure of water pumps and other irrigation equipment. At a later stage, the developers plan to link up with Kenya's meteorological service to include rainfall patterns and predictions into an eventual app. The tool, which is still in its pilot stage, will ultimately also help farmers tell the root course of challenges like a poor harvest or crops failure at a farm. 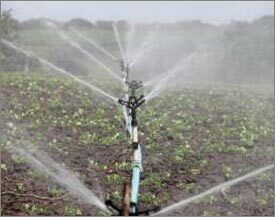 The researchers have set up a number of pilots on farms around Nairobi from where sensors stream data to IBM's cloud based data centres every minute of the day about the availability of water for crops. The test farms are currently equipped with water tank and soil moisture sensors. There is also another sensor that uses infrared light to monitor the health of crops. Talking about the motivation behind the project, IBM Research - Africa V-P Dr Kamal Bhattacharya said, "Kenya has 15mn small scale farmers who contribute hugely to the country's GDP but we are still investing on food security."